My husband’s aunt makes the BEST candy each Christmas- English toffee, peanut brittle, and homemade caramel are always abundant around this time of year. 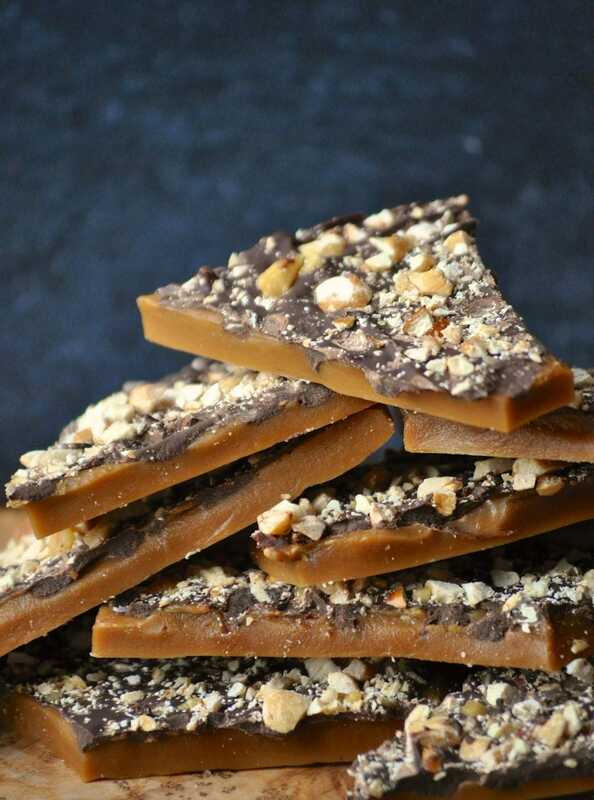 This year I am making lots of homemade candy to pass out too, and this English toffee is always tops on my favorite Christmas candy list! 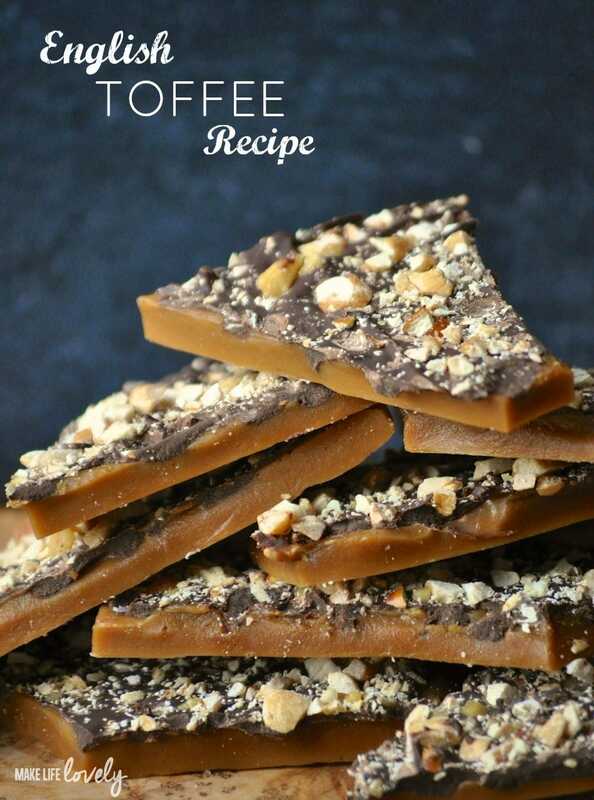 Today I’m sharing my favorite English toffee recipe that tastes amazingly delicious and is so addicting! 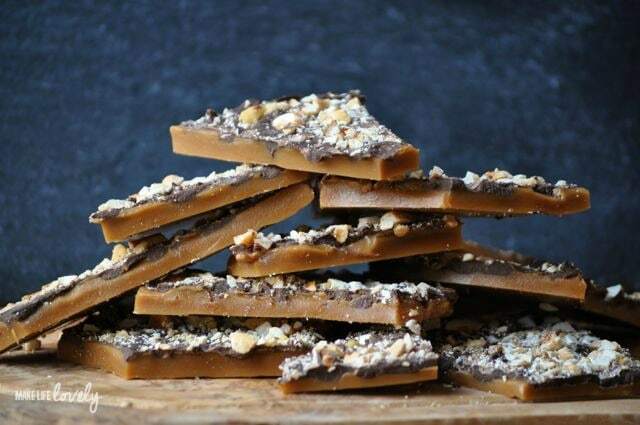 Everyone I’ve shared this easy English toffee recipe with absolutely loves it. 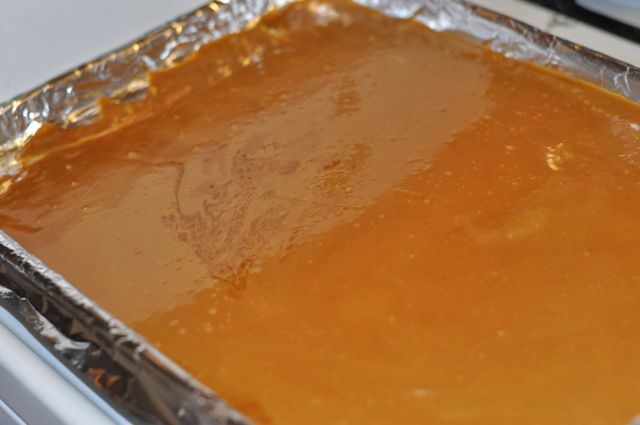 Homemade toffee is really quite easy to make, it just takes a little patience. I’ll walk you through the whole process. You don’t have to have a candy thermometer to make this recipe, but it definitely will help if you do have one. There are other ways to test if your candy is cooked to the right point, but I always find the most accurate results when I use my candy thermometer. 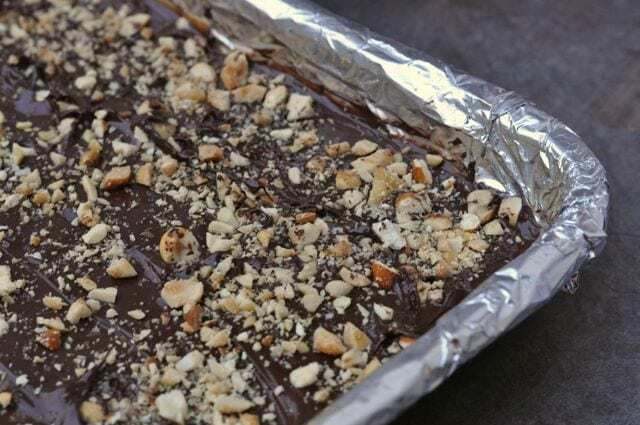 I used a mix of nuts for the nuts on top of my toffee, because I like the combination of flavors. 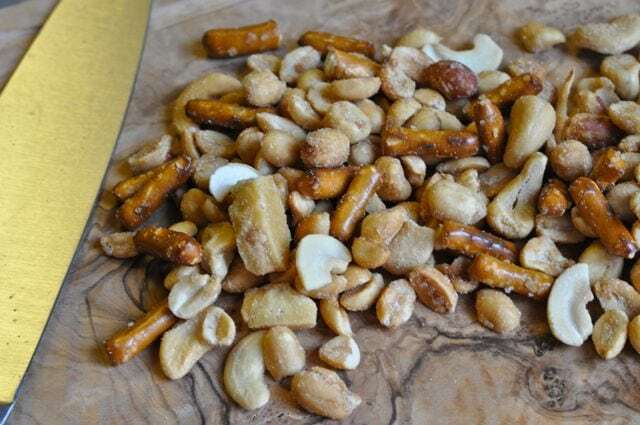 Really, any nuts will do though, as long as they are finely chopped. Step 1. Combine the butter, sugar, and salt in a large heavy saucepan. Cook over medium heat and allow the mixture to come to a steady boil, stirring constantly. Once the mixture turns a dark amber color, it is done. To test if the mixture is done cooking, insert a candy thermometer. 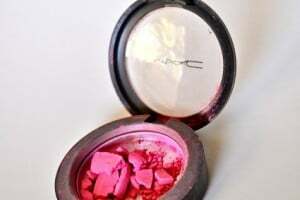 Remove from heat when the temperature reaches 290-295 degrees. You can also drop a small bit of the mixture into ice cold water, and if the drip turns hard and brittle, it is done. Step 2. 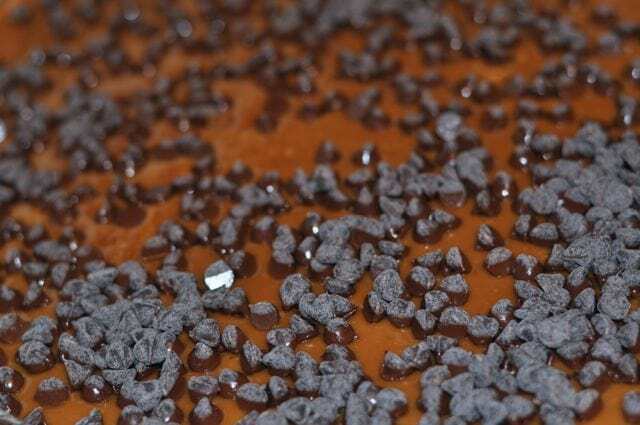 Carefully pour the mixture into a foil-lined baking sheet. Let harden for a minute or two, and then sprinkle on the chocolate chips. Let those melt on top for a minute or two, and then spread the chocolate evenly with a knife. Sprinkle on the chopped nuts, and press down slightly into the nuts. Let the English toffee candy cool and harden, and then break into pieces. Store in an airtight container. 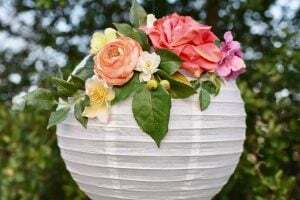 Doesn’t this look amazing?! This decadent Christmas candy is rich and has a nice crunch to it. The smooth chocolate top balances the crunchy, buttery toffee and the chopped nuts on top. What are your favorite treats to make for Christmas? 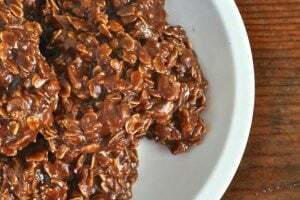 I make these Andes Mint Cookies, Chocolate No Bake Cookies, and these amazing Special K Bars every single Christmas without fail. My mom made them every Christmas for us a child, then I learned to make them as a teenager, and now I’m passing on these same traditions to my children! Originally posted in December 2014, updated in December 2018.